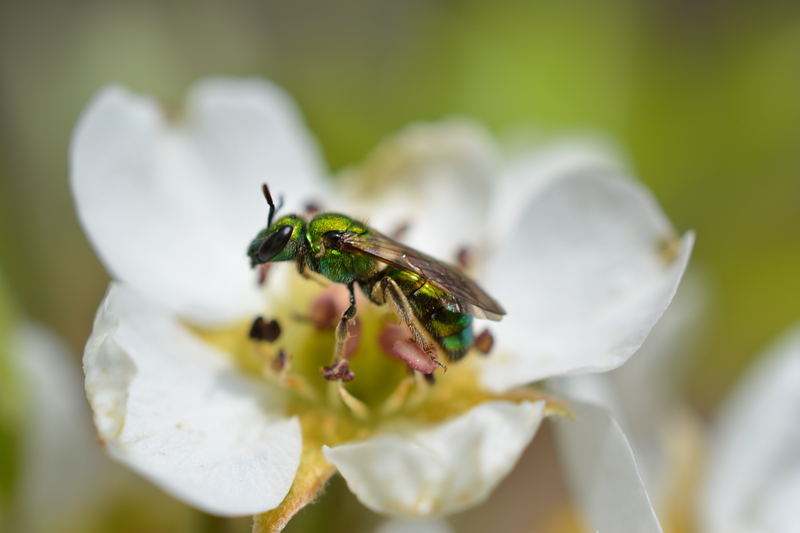 The metallic green sweat bee, so named for their attraction to human sweat, are one of the jewels of the bee world. This small bee is represented by 4 species found in the United States with only one Augochlora pura, found north of Texas. This solitary bee nests in preexisting tunnels or excavates a chamber in rotting wood. Females collect pollen on hairs on their hind legs called (scopae) that she takes back to her brood cell to provision her young. These bees produce two to three generations each season. Females born in late summer spend the winter dormant in hibernacula, under a rotting log. 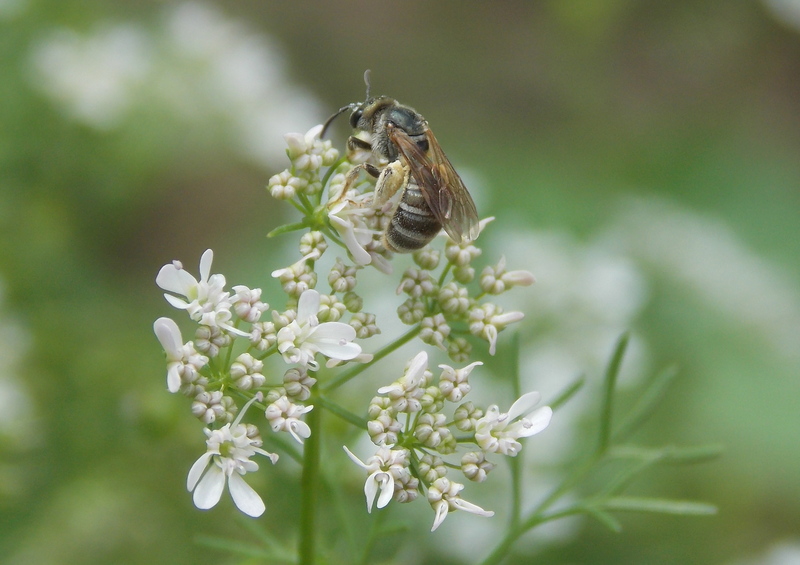 These bees are generalist pollinators and can be found pollinating a variety of native and non-native flowers. This species emerges early in the spring and can be found pollinating spring ephemerals such as trout lily. The green sweat bee, unlike its other sweat bee counterparts, is not attracted to human sweat. 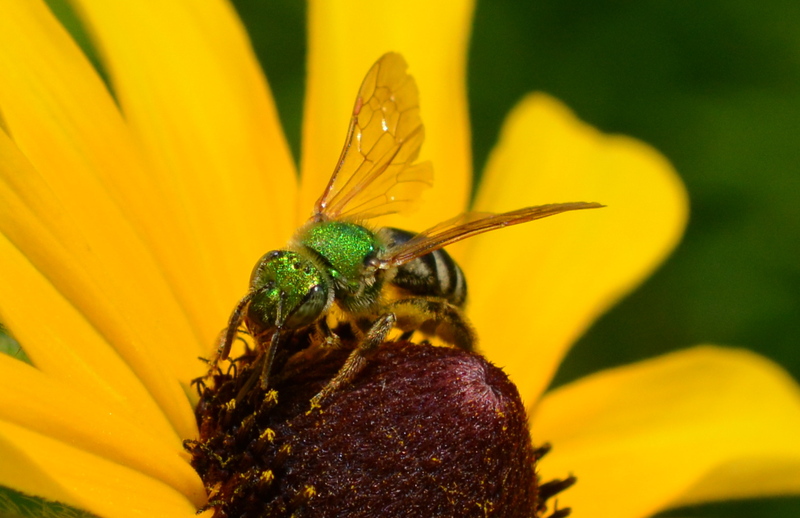 The metallic green sweat bee is totally green while the green sweat bee has a black and white banded abdomen. This small bee is represented by 43 species found in the United States. This solitary bee digs deep vertical burrows underground where eggs are laid. Females collect pollen on scopa hairs on their hind legs. Some species nest communally but provision their own cluster of brood cells. These bees are generalists, pollinating a variety of native and non-native flowers. 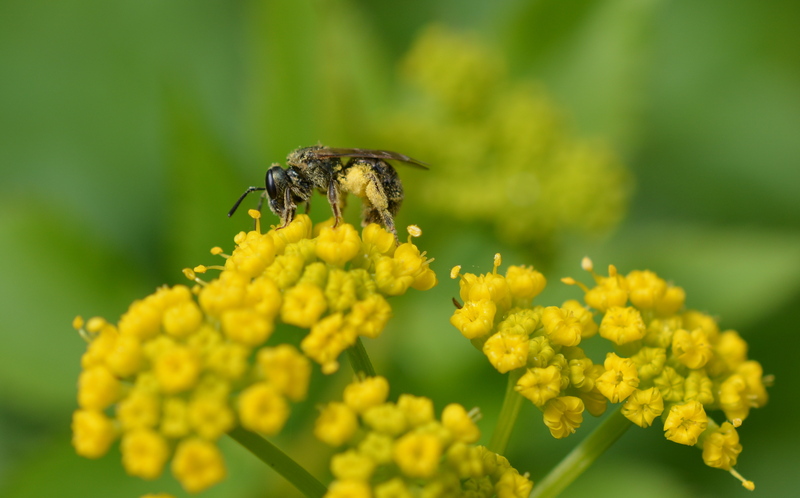 The dark sweat bee found, abundantly in the summer, is represented in North America by 10 species. Their distinguishing features are pale hairs at each abdominal segment giving insert: them the appearance of having striped abdomens. This bee can often be confused with other species such as cellophane bees. Some species start out as solitary bees making brood chambers underground in sandy loam soils. As the season progresses they become semi-social with daughters of the first generation helping to care for the second. Other species are social and have small nests with a single queen and a few workers. These bees are generalist pollinators, and can be found pollinating a variety of native and non-native flowers. Was that taken at Sharpe?